Format: 6 days of face-to-face training over the course of 6 months followed by a 2-day Easter residential and supported by an online portal for sharing resources. 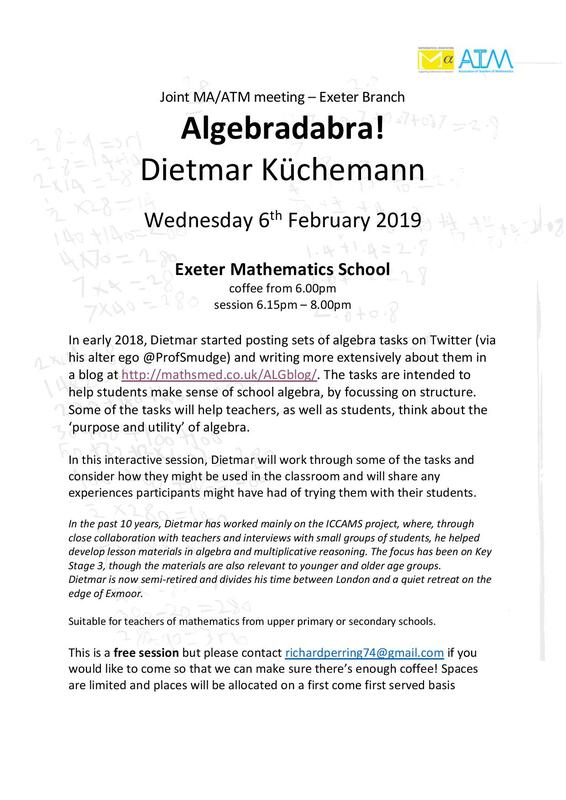 In the South West Exeter Maths School is proud to run the Government’s proven professional development programme for non-specialist and returning teachers. Free of charge to all state school teachers, here’s your chance to enhance your subject knowledge, explore teaching strategies and develop confidence in challenging misconceptions and building understanding in students. Applications for the 2018/19 programme are now open. These are comprehensive courses, each consisting of 6 one-day workshops in the autumn and spring terms, a 2-day residential during the Easter holidays and an evaluation and progress conference to complete the course. Guided lesson planning and mentor support, along with online learning resources, will provide participants with the tools needed to sustain progress once the course is completed. 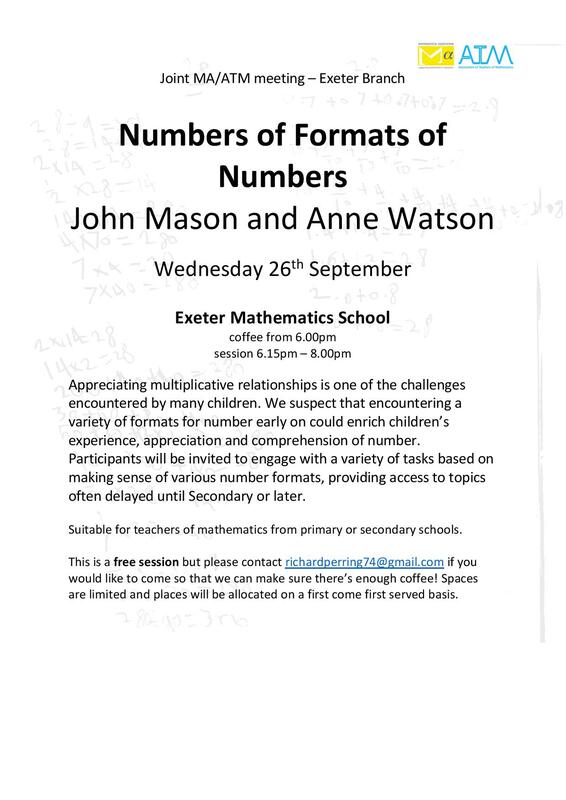 A broad range of topics will be covered including Applications of Mathematics and developing problem solving. Successful applicants will be sent a questionnaire before the course commences, asking them to provide input with regards to key areas that they would like covered; this will ensure that a relevant, tailored programme is delivered. There will also be time to reflect, evaluate and feedback between sessions to ensure that every individual’s needs are met. Participants will have the option to accrue up to 60 Masters credits through Exeter University on completion of up to two Masters level modules that can be cashed in or combined with further modules to achieve a masters-level qualification in mathematics teaching. We recognise that 6 days out of school equates to a lot of cover. Whilst we are unable to meet this cost in full, our funding enables us to make a contribution towards it: depending upon the number of participants this will be in the region of £300 per teacher for the full course. Format: one day conference held at EMS and our beautiful neighbour, Exeter Castle. Delegates select workshops, free lunch!. 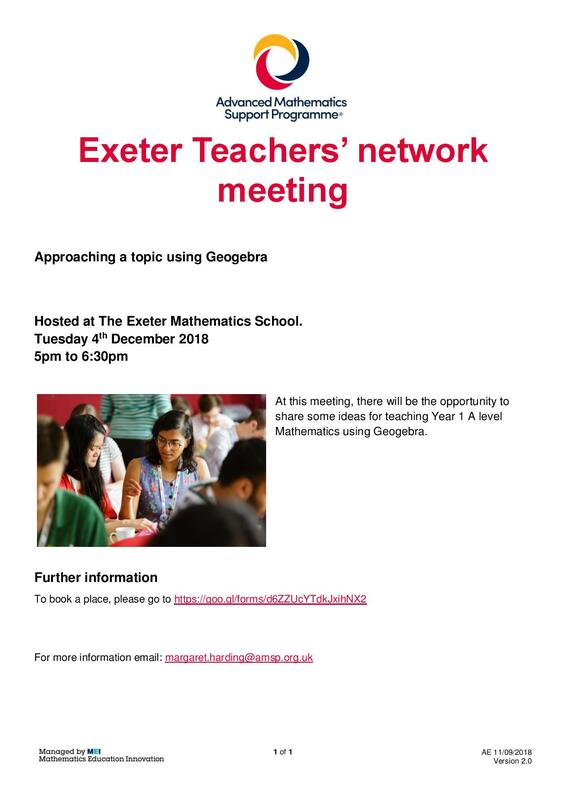 How to get involved: You can email events@exeterms.ac.uk to be added to our mailing list or click on the event you are interested in for a booking link. 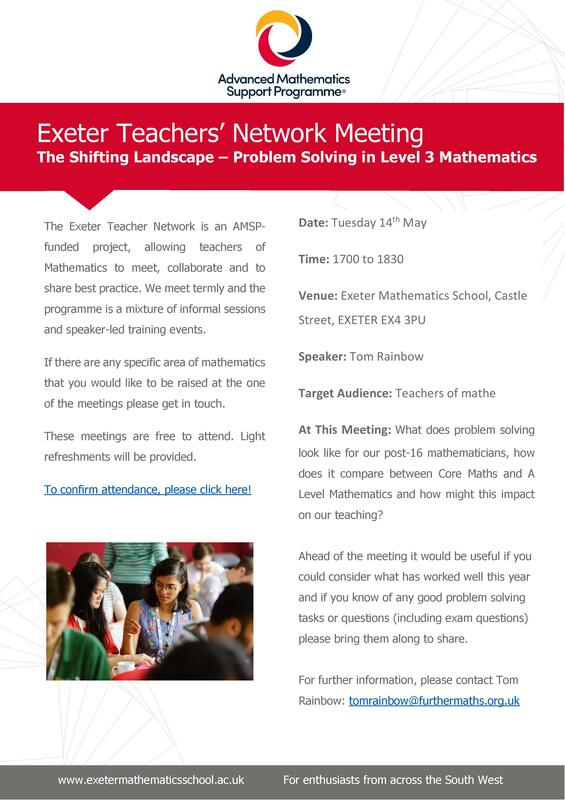 Exeter Teacher Network is an AMSP-funded project, allowing teachers of maths to meet, collaborate and to share best practice. We meet termly and the programme is mainly speaker-led training events and may include informal sessions. The main focus of this network meeting is to provide teachers with a chance to explore and consider how the changes in the new A level syllabus have impacted on the the A level assessments. 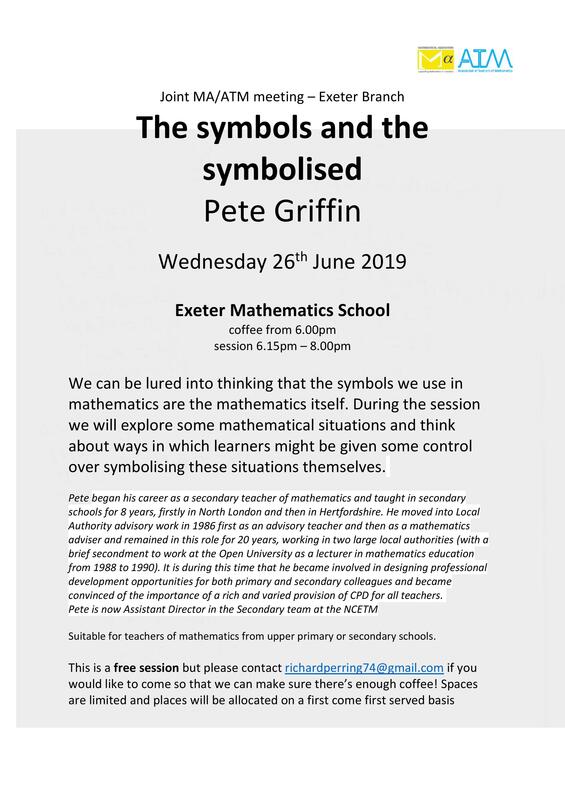 We will be examining a selection of key questions from last summer’s examinations and considering the implications for our teaching of A level mathematics and how to best prepare our students for this summer’s examinations. 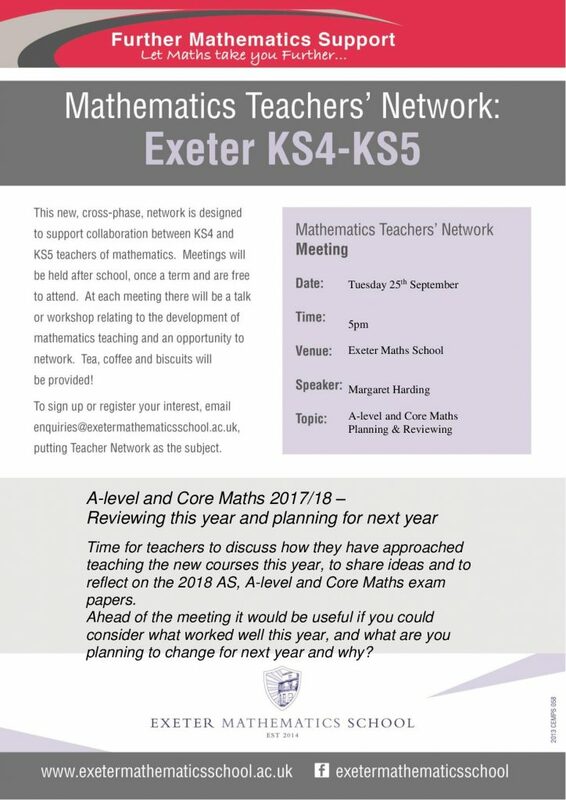 We will also be taking a look at last summer’s Core Maths results, looking at variations between exam boards and thinking about planning for the future. Loughborough University’s Colin Foster (@ColinFoster77 on Twitter) who you may know from his many publications, from the mathematical etudes website or the mathematical beginnings website or from his podcast with Craig Barton. The content of the session is still to be confirmed, but it’s worth getting the date in your diary now!